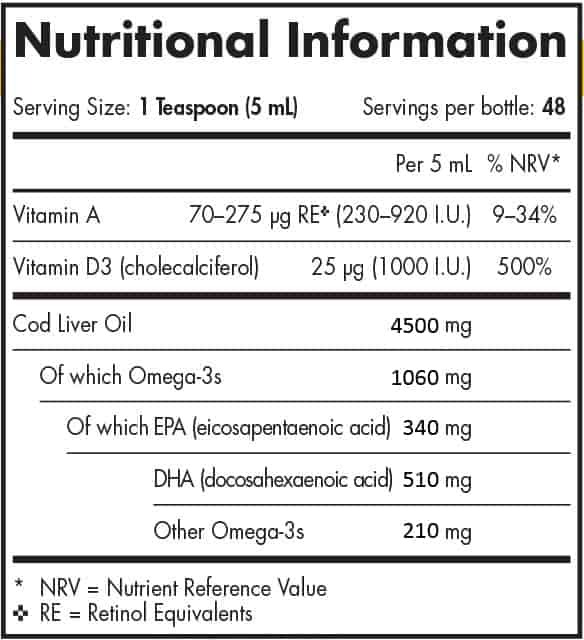 Nordic Naturals cod liver oil is derived from 100% wild Arctic cod and is free from any synthetic additives. As well as the benefits that are obtained from omega 3, each serving also provides 25 μg of vitamin D3 in its natural from which is more readily absorbed and utilised by the body. All batches are tested by a certified lab for environmental toxins, including heavy metals. Pleasant tasting with no fishy after taste. 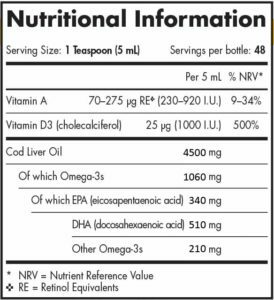 purified arctic cod liver oil (fish), natural lemon flavouring, antioxidant: vitamin E (as d-alpha tocopherol), antioxidant: extracts of rosemary, vitamin D3 (cholecalciferol in olive oil).